Framework for assessing standards for practice for registered nurses, enrolled nurses and midwives provides a resource for persons assessing the standard of practice of nurses and/or midwives, as well as for nurses and/or midwives whose performance is undergoing assessment. 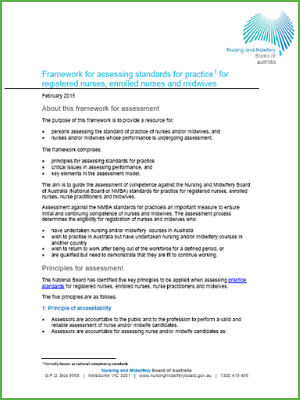 The aim is to guide the assessment of competence against the Nursing and Midwifery Board of Australia standards for practice for registered nurses, enrolled nurses, nurse practitioners and midwives. This important measure ensures the initial and continuing competence of nurses and midwives.